Larry Hogan, Republican candidates for governor, announces running mate Boyd Rutherford. HEALTH BILL GOES TO O’MALLEY’S DESK: The Maryland Senate gave final approval Wednesday to a plan for the state to offer temporary, retroactive health insurance to residents unable to sign up through the state’s troubled online marketplace. Gov. Martin O’Malley sponsored the legislation and is scheduled to sign it into law this morning, Jenna Johnson reports in the Post. Jennifer Shutt of the Salisbury Daily Times writes that Mid-Shore Sen. Richard Colburn voted in favor of the bill to provide retroactive health insurance to people who tried but could not get plans through the state exchange. His vote Wednesday in support of the bill differed from the vote he took on Jan. 20, when he opposed the bill. A LATE ‘SUCCESS’ WITH GLITCHES: A few weeks ago, U.S. Rep. Donna Edwards invited a guest to President Obama’s State of the Union address: Lorita Katherine Waltz, a 49-year-old nurse from Prince George’s County who the congresswoman considers an Affordable Care Act “success story.” But Waltz’s family did not become enrolled in a new insurance plan until Tuesday — the day of the president’s address — after weeks of trying and only with help from state leaders, writes Jenna Johnson in the Post. JAIL TIME: Two senators say 30 years in prison isn’t long enough for someone who commits a ghastly murder, according to an AP story in the Daily Record. But right now, that’s the maximum for defendants convicted of second-degree murder, as per Maryland law. REVERSING SLAVERY VOTE: The Civil War casts a long shadow, writes Tim Wheeler in the Sun. In the first year of that wrenching conflict, Maryland’s lawmakers voted unanimously for a constitutional amendment to bar the federal government from abolishing slavery. Now, more than 150 years later, some legislators in Annapolis are looking to put the state on the right side of history. BERETTA TO BUILD PLANT IN TENNESSEE: Fredrick Kunkle of the Post writes that a decision by a Maryland gun company to open a new plant in Tennessee led some Republicans to blame Gov. Martin O’Malley and the state’s tough new gun control law for the loss of several hundred jobs. Beretta USA officials announced Wednesday that the company would build a $45 million manufacturing facility outside Nashville and create 300 new jobs. Last year, the centuries-old Italian gun-maker threatened to abandon plans to expand its U.S. headquarters in Prince George’s County when Maryland weighed some of the toughest gun laws in the country, Erin Cox writes for the Sun. Then, at least eight states began trying to woo Maryland gun manufacturers. PRE-K STRAIN: Kaustuv Basu of the Hagerstown Herald Mail reports that Washington County school board Vice President Donna Brightman told local lawmakers on Wednesday that if Maryland decides to offer universal prekindergarten for 4-year-olds, Washington County would be looking at an additional 1,300 students in its school system. 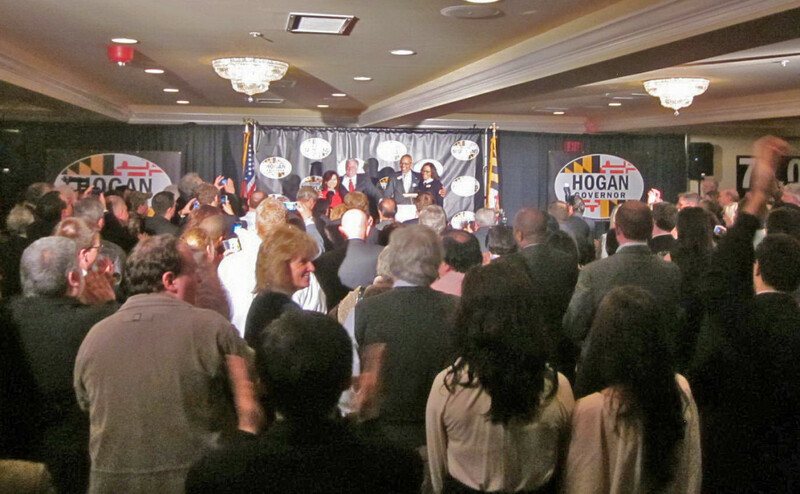 HOGAN ANNOUNCES RUNNING MATE: Larry Hogan, the newest entrant in the Republican primary for Maryland governor, kicked off his campaign Wednesday with a boisterous rally at an Annapolis area crab house and the announcement of a running mate, writes John Wagner for the Post. Hogan tapped Boyd Rutherford, a fellow Cabinet secretary under then-Gov. Bob Ehrlich, as his candidate for lieutenant governor. Hogan became a late entry in the governor’s race last week. He joined a field that includes Harford County Executive David Craig, Del. Ron George of Anne Arundel County and Charles County business executive Charles Lollar. DELANEY COULD BE A CONTENDER: The editorial board for the Frederick News Post takes a look at a possible run for governor by U.S. Rep. John Delaney and notes that a recent poll of primary candidates included Delaney, who would not address whether he had commissioned the poll. If Delaney does decide to join that race, he could be a formidable contender. Each of the three principal candidates — Attorney General Doug Gansler, Lt. Gov. Anthony Brown and Montgomery County Del. Heather Mizeur — has some issues that could work in Delaney’s favor. DISTRICT 38A: Concerned about Somerset County’s representation in Annapolis, Crisfield Mayor Percy Purnell has filed to seek its delegate seat, reports Jennifer Shutt for the Salisbury Daily Times. The District 38A seat represents Somerset County and parts of Wicomico. DISTRICT 42 SENATE RACE: Connie DeJuliis of Glen Arm filed for state Senate Wednesday, pitting her in the Democratic primary against incumbent Sen. Jim Brochin in District 42, which stretches from Towson to the Pennsylvania border, writes Len Lazarick for MarylandReporter.com. DeJuliis, a former one-term delegate from Dundalk, then known as Connie Galiazzo , joins a handful of former delegates getting back in the game as candidates for General Assembly and a half dozen Democrats challenging incumbent senators of their own party. LEGGETT’S BORROWING: Some think that Montgomery County Executive Ike Leggett’s decision to take on more debt is pushing the outside of the envelope when it comes to borrowing, writes Bill Turque in the Post.